Children learn and practise many of the skills that they need for reading and writing from a very early age. They do this through a wide range of activities and experiences, at home, and in school. We will develop pupils’ spoken language, reading, writing and vocabulary as integral aspects of the teaching of every subject. English is both a subject in its own right and the medium for teaching. For children, understanding the language will provide access to the whole curriculum. Fluency in the English language is an essential foundation for success in all subjects. Children will be taught to speak clearly and convey ideas confidently using Standard English. They will learn to justify ideas with reasons; ask questions to check understanding; develop vocabulary and build knowledge; negotiate; evaluate and build on the ideas of others; and select the appropriate register for effective communication. They will be taught to give well-structured descriptions and explanations and develop their understanding through exploring ideas. This will enable them to clarify their thinking as well as organise their ideas for writing. We will develop children’s reading and writing in all subjects to support their acquisition of knowledge. Children will be taught to read fluently, understand extended prose (both fiction and non-fiction) and will be encouraged to read for pleasure. We will do everything to promote wider reading. We will provide library facilities and set ambitious expectations for reading at home. We teach literacy daily as a discrete subject in the ‘Literacy hour’ from Year 1 to Year 6 following the Primary Literacy Framework, with opportunities for Literacy in the Foundation Stage being incorporated into the child’s day according to the principles of the Early Years Foundation Stage (EYFS). The Power of Reading is taught in Literacy alongside the Primary Literacy Framework. Depending on the length of the text the class will focus on it for 2-6 weeks. Literacy will then be taught using the text and the children will produce a range of work from book talk and discussion, drama and role-play and writing in different genres. Extra support for individual children is provided by volunteer readers. They read regularly with children and help to improve reading skills, develop language and vocabulary and build confidence and self esteem. Phonics is the systematic teaching of the sounds, or ‘phonemes’, that accompany the written letters (‘graphemes’) in English. It is designed to teach children to become confident and fluent readers by the end of Year 2. At Pakeman, we follow ‘Letters and Sounds’, a document published by the Department for Education. It is broken down into 6 parts, or ‘phases’. Phase 5 is taught throughout Year 1 and focuses on different ways of spelling the same sound eg. /oi/ and /oy/ and different ways of pronouncing the graphemes they already know eg. /ear/ in ‘hear’ and /ear/ in ‘bear’. Phase 6 is taught throughout Year 2. This phase focuses on consolidating all of the other phases, as well as introducing ‘rules’ for reading and spelling, such as prefixes, suffixes and when to double or drop a letter. There are 40 words in the screening check which children are asked to read on a one-to-one basis with their teacher. The check is made up of ‘real words’ (eg. ‘mud’) and ‘non-words’ (eg. ‘splog’) and children need to apply their phonic knowledge to read all words. Preparation for the check takes place during the daily phonics session, but you can help your child at home by practising phonics on a regular basis. If you would like more information on the phonics screening check for Year 1 children, please click here. Children will develop the stamina and skills to write at length, with accurate spelling and punctuation. They will be taught the correct use of grammar. They will build on what they have been taught to expand the range of their writing and the variety of the grammar they use. The writing they do will include narratives, explanations, descriptions, comparisons, summaries and evaluations. Such writing supports them in rehearsing, understanding and consolidating what they have heard or read. 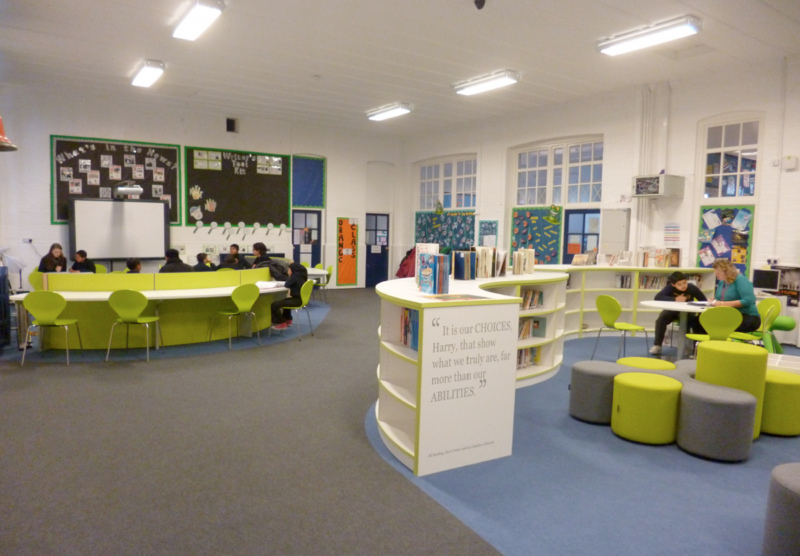 Our library is an integral part of the learning environment and is central to the life of the school, as well as in a physical sense being right at the heart of the building. It is designed for ease of access to all pupils. Reading is an essential life skill for the 21st century. 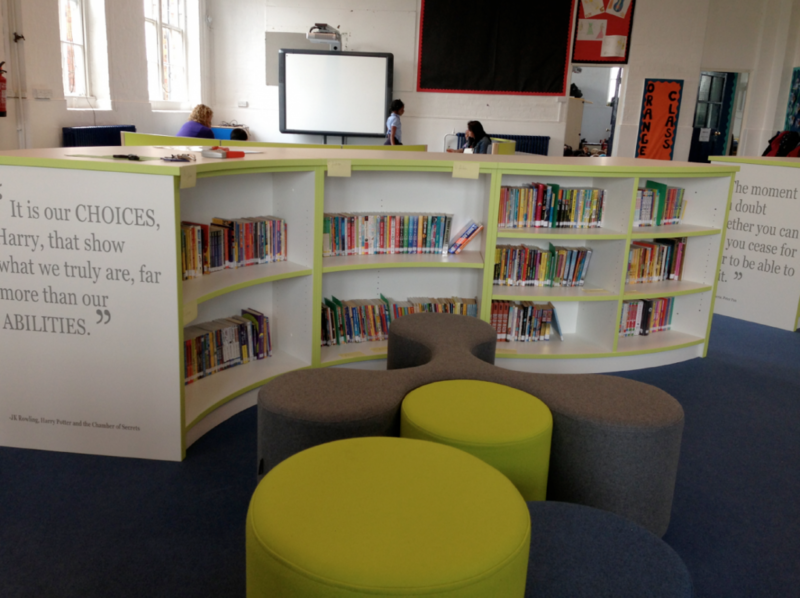 Our school library aims to contribute to our pupil’s learning and development by providing a safe, stimulating and well-maintained environment which helps support teaching and learning and assists in our aim to raise achievement. 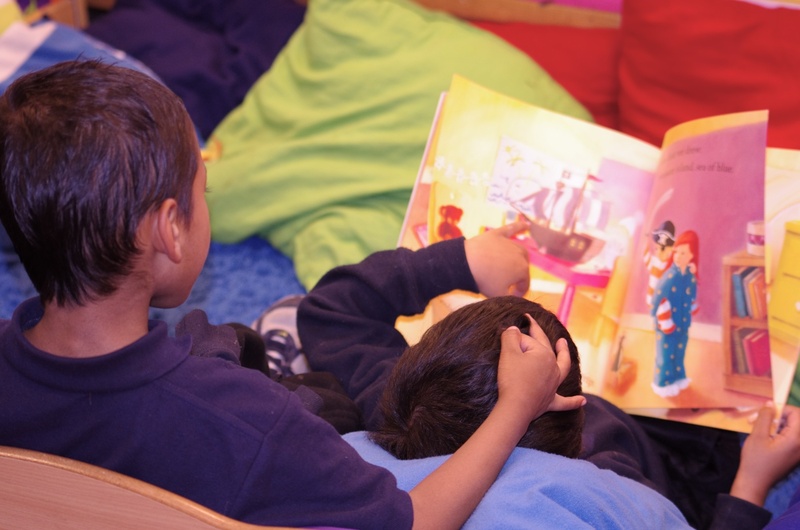 As well as providing information for learning in a variety of formats, we also want our library to encourage a real love of reading for pleasure to develop readers for life. Through the use of our school library, we aim to improve reading skills and, in turn, improve both levels of attainment and progress in reading and writing. The books in our school library are kept up-to-date and relevant, relate to the topics studied in class, and provide for the pleasure of the children. We are continually looking for new and exciting books to add to our collection.